The Croydon Half Marathon is organised by Striders of Croydon. An undulating, accurately measured course is perfect for those new to half marathon running or those looking for a last long run before their spring marathons. There are prizes on offer to leading men and ladies plus a variety of age category prizes and team prizes for both male and female (3 to score). Medals and finish line goodies on offer to all finishers. Charitable donations from the event will be made to Sandilands Club and other local charities. The route starts and finishes at Sandilands and follows a two lap route around the streets of Croydon. Please note there is a short initial lap followed by the two full laps so don’t be surprised if you see the finish line ahead of you after the first mile! The route has been accurately measured and carriers a certificate of course accuracy. The route will be clearly marked using large route arrows, as well as being marshalled throughout. The route is run along the streets of Croydon and the roads will NOT be closed. On the main roads of the course you are required to run on the pavements. The race crosses a section of the Tram Link line and while we will have stewards on duty, it is your responsibility to be alert of any trams. At Oaks Road, should the red lights show you must stop. You can view a copy of the course map here. There is very limited parking available for the Croydon Half Marathon, so we strongly advise runners to use public transport to get to the race. East Croydon Railway Station is just over a mile away from Sandilands Club, so runners can access the race via bicycle or on foot. Alternatively, you can take buses 119, 194, 198 or 466 from East Croydon Station to the Ashburton Road Addiscombe stop and take a short walk to the club. West Croydon is slightly further away from the race start, but is served by London Overground and Southern trains. 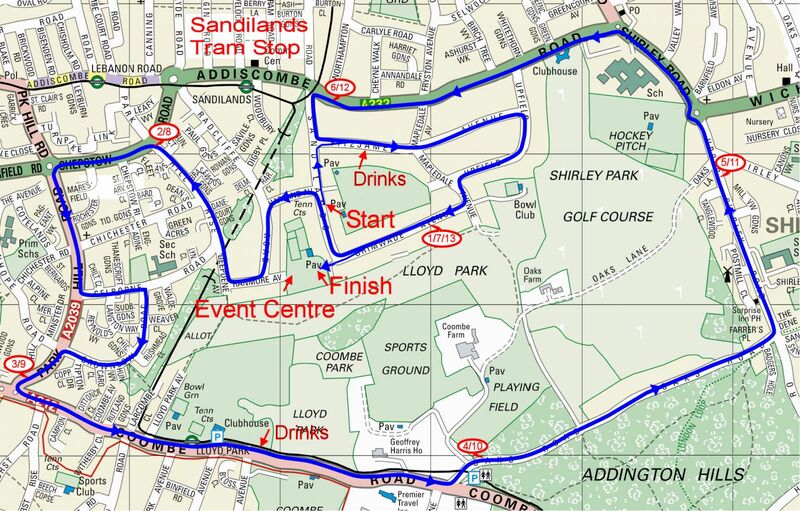 Runners can also use the Croydon tram service to Sandilands or Lloyd Park to get to the race.